Ripe, yellow-fleshed peaches should have a golden hue behind their reddish blush. That blush is not a sign of ripeness, it's just where the sun shone on the peach. This coloration is easiest to see at the stem end because a scant bit of sun hits the peach there and peaches don't tend to develop any blush where they attach to the tree. A lighter yellow color means a less-ripe peach. Avoid peaches that still have a green tinge to their color. 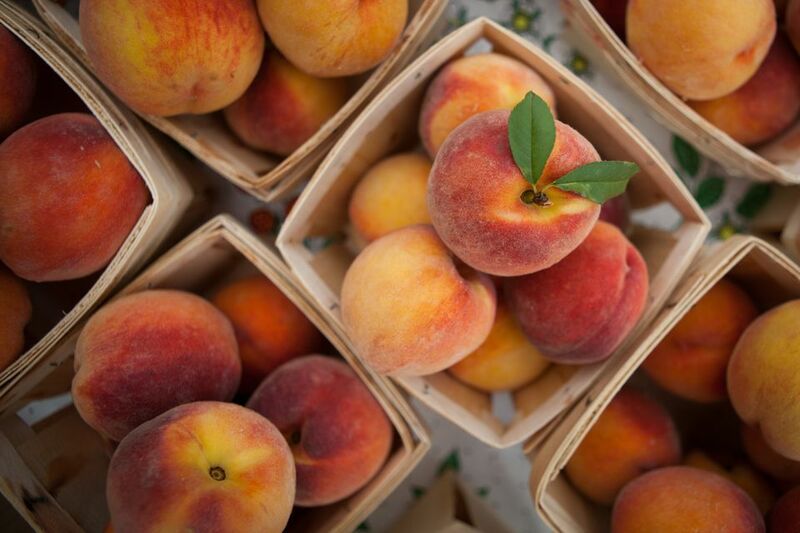 Also check peaches for bruises, scratches, or flat areas—you want none of those. Also, skip over any peaches with wrinkly skin, they were probably kept chilled after harvest for too long and dried out. Most peaches should smell the way you want them to taste. No smell usually means no taste, and that your peach is not yet ripe. Know that some varieties can have great flavor without that knock-you-out peach smell. If you're shopping at a farmers market, ask the farmer for guidance about the variety you're considering. Tennis ball-like peaches are not ready to eat but are excellent candidates for taking home for ripening to eat later in the week. Real "give" when you squeeze means the peach can be immediately eaten or left out on the counter for a day or two first. These peaches are great to use in baking because they hold their shape better than softer ripe specimens. Super-soft peaches are already bruised, just from sitting there. They are a tad overripe but can make for tasty, if exceedingly juicy and messy, eating. If you somehow end up with a mealy peach, you likely have found a specimen that has been picked when it was either way too green or way too ripe and then chilled, then brought to room temperature. Avoid the seller who sold that peach to you in the future.